Just like last week’s episode, tonight’s South Park introduces a topic rife with political landmines, only to sidestep it in favor of a more humanist approach. That should be no great surprise at this point, except that Trey Park and Matt Stone seem to be two of the only people actually achieving this on a consistent basis. So it’s always a refreshing surprise to be reintroduced to their unique viewpoint. "The Last of the Meheecans" isn’t really about immigration reform so much as its about the narcissistic viewpoint that America must be, as a point of irrefutable fact, the best place in the world to live. For some, that’s a fairly ballsy thing to say, but the way in which Parker/Stone say it bypasses political grandstanding and casts their gaze instead on our supposed understanding of those that have immigrated to America and currently live/work here. South Park could have easily built an episode that piggybacked off recent Republican debates, featuring an episode in which the U.S. government built the equivalent of The Wall from Game Of Thrones in order to keep people out. Instead, it questioned why, in these tough economic times, anyone would still want to come here at all? That’s not looking at the problem in a different light; that’s completely reframing the question. The underlying theme tonight: We’re doing a lot more to prevent people from coming to this country thanks to the state we’re in as a nation as opposed to the state of security around our borders. We get to that subversive statement by starting with a wholly innocent game of “Texans Versus Mexicans.” Well, as innocent as a game called “Texans Versus Mexicans” can be, I suppose. The history behind the game is totally lost on the boys, who probably saw a picture in a book and decided it was cooler than playing “Shirts Versus Skins.” In other words, they co-opt the iconography without actually understanding the historical ramifications of it. Taking things for granted on a surface level is a common theme throughout the hour: The boys assume Butters finishes the game with them; a perfectly nice couple assumes that all immigrants love being undocumented workers; a border patrol officer assumes all traffic over the fence will flow in one direction. “Butters is one of those people that you can never remember if he was there or not,” says one of the boys at the midway point of tonight’s episode, and it holds true of most aspects of society that we take for granted. It’s not that there’s intentional malice behind certain precepts, but they aren’t any less harmful for being subconscious, either. The couple that takes Butters into their home after running him over on a dark highway honestly think they are doing “Mantequilla” a favor by letting him clean their windows and tidy up their lawn. It’s not an act they perpetrate on him when he’s around. Their viewpoint stays the same whether or not he’s in the room. It’s a myth that has hardened into “fact” because, in Parker/Stone’s view, both sides have bought into it by forgetting any other way in which life could be. Both perform roles without questioning why those roles need to exist in the first place. So leave it up to Butters/Mantequilla to shake things up. After being dropped off at a Mexican restaurant (where “his people” are, supposedly), he surprises the employees there through his role-play enthusiasm. Butters’ joy as Mantequilla inspires the workers to return to their homeland. This, in turn, sparks a revolution that forces the real border patrol to keep people from crossing from America to Mexico, not the other way around. South of the border, Mantequilla is celebrated, Life Of Brian-style, as a new Mexican messiah. 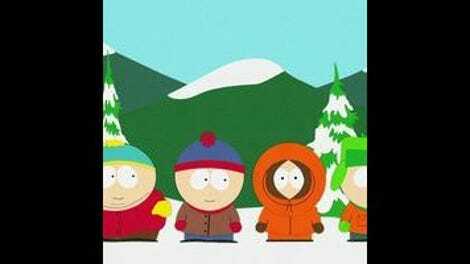 Up north, Cartman proves much better as a real border patrol officer than a pretend one, killing dozens and rounding up hundreds more in his attempt to win what is, in his mind, just an extension of the game he started in his backyard. There’s a cheerful nature to all of these proceedings. Nothing outside of Cartman’s single-minded focus on winning the game is performed with anything other bemused curiosity. (Well, aside from Randy’s invocation of Darth Vader upon seeing the leaves in his yard.) That attitude worked for the majority of the episode, using satire rather than straight-up anger to try to reframe audience perspective. But “The Last of the Meheecans” also missed an opportunity to explore the true impact of such a large work force leaving the country en masse. We never got to see how America adjusted to this new reality, except in the futile attempts at stopping the migration across the border. Would there have been a total socioeconomic collapse? Would citizens from other countries flock to fill the positions? Would one of those countries seek to take over the country in a moment of weakness? Would unemployed Americans be delighted to have new job openings, only to then be disgusted by the long hours and hard labor? Seeing Mantequilla lift the spirits of Mexico was fun, but South Park missed truly twisting the knife on its own soil by leaving these types of possibilities out. Still, that’s a relatively small complaint in the grand scheme of things. 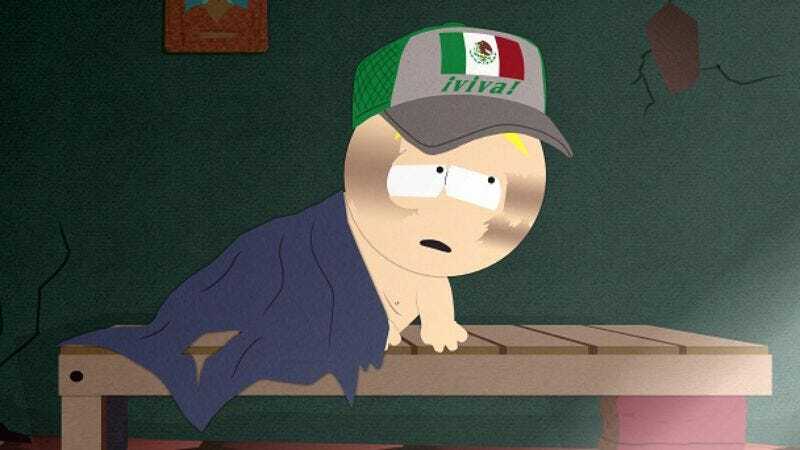 Butters’ transformation into Mantequilla was ridiculous, yet perfectly in line with the internal logic of the show. I’d love to think Butters’ newfound confidence after this trip will last, even if his friends still don’t think he’s worthy of being leader in the next game of “Texans Versus Mexicans.” But Stan’s recent problems didn’t get mentioned at all tonight. Granted, he wasn’t the focus of the episode, but there was nothing to suggest anything out of the ordinary had recently happened with him. So it’s difficult to know if the show’s recent trend towards continuity will hold in this regard. But so long as the show keeps up its human-scale focus on problems that perpetually perplex us, then that will be all the continuity most of us will ever need from this show. Of course Butters would name himself the Spanish word for “butter” while in character. All the kids who play as “Me-hi-cans” wore dirt on their face. Not because they think Mexicans are dirty, but because they are trying to get into costume on a limited budget. A small example of how innocent the game was, at least to them. It’s probably not coincidental that the most senior officer in charge along the border looks and sounds like Cartman 50 years from now. Raise your hands, Breaking Bad fans: How many of you wish that Butters had been dropped off at Los Pollos Hermanos? While not an instant classic, the song “Work, Mexican, Work!” was catchy all the same. Anyone else flash back to “The Return of the Fellowship of the Ring to the Two Towers” when Butters started to make an epic trek while everyone else tried to track him down? The Darth Vader thing came completely out of left field, but I’m not sure I’ve gotten sick of using that “NOOOOOO!!!! !” as a cheap way to get a laugh just yet. I loved the chase at the end, which not only took place over a variety of terrains on a variety of vehicles, but ended with Butters outsmarting Cartman through the use of a Mantequilla piñata.